Oops! 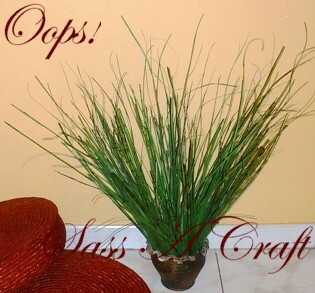 Faux Grass Blunder | Sass a Craft - Muslim Women are Smart & Crafty Too! My faux plants look withered despite the fact that they are fake. I tried placing them in the bathroom to add a splash of color but the frequent water spills only made matters worst. The plants definitely had to go, but the clay pots are keepers. They’re weighty, completely reusable and of my favorite color. It resembles the head of those funny-looking but extremely famous troll dolls. I am not feeling this one. Back to the drawing board. i am writing the blog about bamboo home decor , i would like tio suggest suppose make also the bamboo in your home there! You have some gorgeous pieces, especially the lamps.